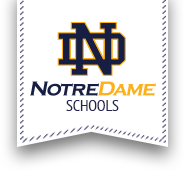 There will be a free SAT review course offered to Notre Dame students. This four-session class is designed to prepare for the October 6th SAT Exam but all students are welcome. The dates will be 9/25, 10/2, 10/3, 10/4 from 7:30 pm-9:00 pm in room 102. Please sign up in Guidance by Friday, September 21.